This function can be used by the AC/DC Clamp Meter CM4372 and CM4374, AC Clamp Power Meter CM3286-01, and Display Unit CM7291 to display waveform data for the functions provided by each instrument. For example, current and voltage waveforms can be displayed when using the CM4372. The frequency for waveforms that can be measured varies by instrument. For the AC/DC Clamp Meter CM4372 and CM4374, frequencies of up to 1 kHz are supported. 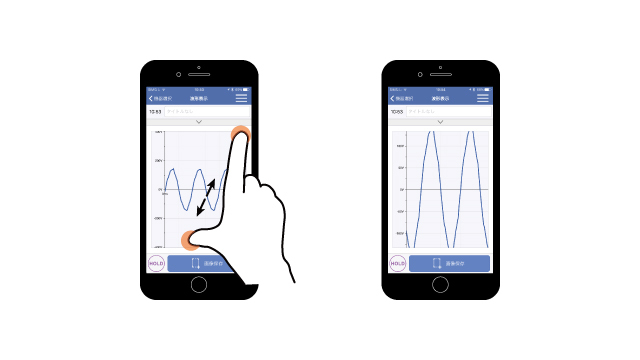 GENNECT Cross automatically sets the sampling frequency and sampling time (i.e., measurement time) based on the frequency of the waveform being measured and displays the resulting waveform. 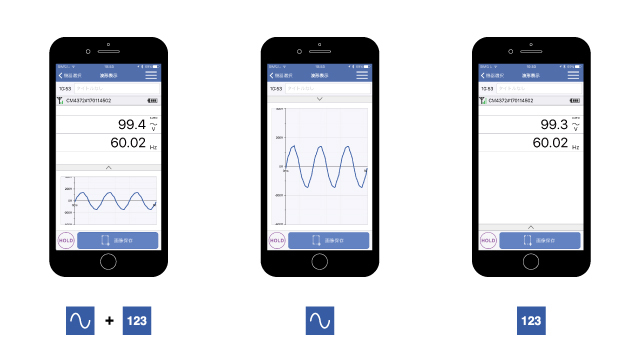 For example, if you measure a 60 Hz sine wave using the CM4372 or CM4374, the app will display a waveform covering 3 cycles. The display can be switched among three modes: simultaneous measured value and waveform display, waveform display, and measured value display. You can pinch in and out on the waveform to zoom in and out. Measured waveforms can be converted to image files. 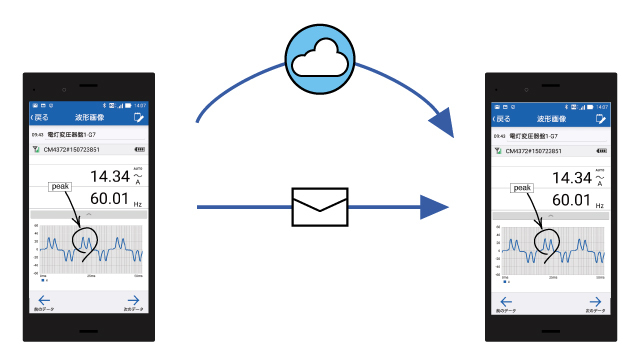 In addition, you can leave handwritten memos and enter text on top of image files. 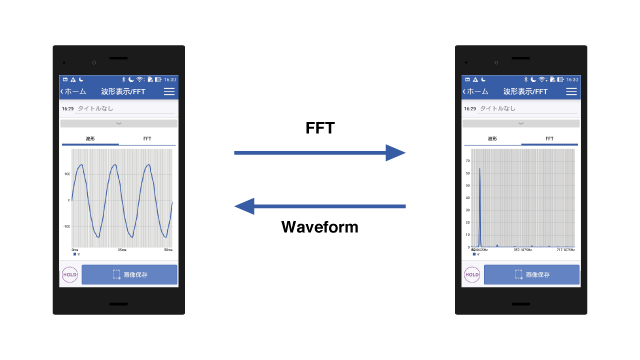 You can perform FFT conversion on measured waveforms so that you can view individual frequency components. *This simplified FFT conversion process does not take calculation error into account. The AC/DC Clamp Meter CM4372 and CM4374 provide functionality for measuring in-rush current. 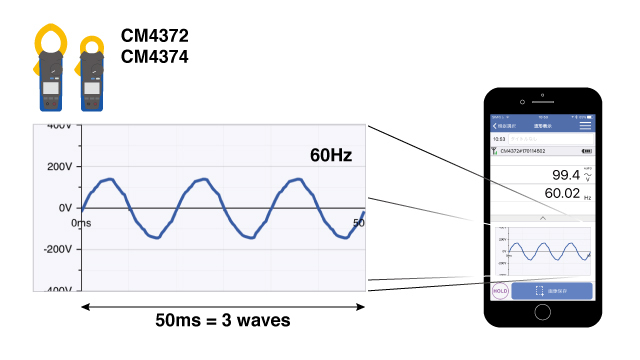 Two waveforms measured using the in-rush current function can be saved in the instrument’s memory, and those waveforms can be displayed by GENNECT Cross. *This functionality is available only on the CM4372 and CM4374. FAQIs it possible to save numerical data for a waveform during waveform measurement? FAQWhat is the highest-frequency waveform that can be measured using the wavelength measurement function? FAQHow many measurement sampling frequencies does the waveform measurement function support?